Carreras is a member of Basildon & District Lawn Bowls Association and is affiliated to Essex County Bowling Association, Essex County Women's Bowling Association, Southend Bowls Association, and Bowls England. We play in both the Basildon and Southend Association leagues, and in the numerous club and individual competitions organized by both Basildon and Essex County. In addition Carreras has a full programme of mixed friendly matches played at weekends against mainly local clubs. There are numerous club knockout competitions for members of both sexes for which trophies are awarded and presented to winners and runners-up at the end of season dinner dance. Social bowlers are just as welcome if you choose not to play competitively and we have a Club Day each Wednesday where you can have a 'roll up' and socialize with other members. The Club's membership fee is £15 per year, plus match fees of £1.50 per game and £2 for each club competition entered. There is also an annual 'green fee' payable to the Basildon Council, who own and maintain our green, and this allows play as a Club team member on any of the Council’s greens. 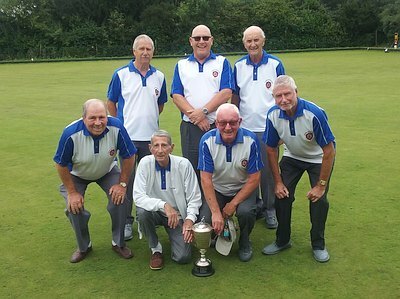 In 2018 we were winners of the Basildon Association’s Rothmans Trophy. 'The friendly club': open to men and ladies of all ages and abilities, we extend a warm invitation and welcome to new members. Find us in the extensive Whitmore Park - off Whitmore Way, in Basildon. New members are very welcome - if you're interested, come and talk to us and give it a go at one of our 'Come and Try' days.